Cooking in real life rarely goes as smoothly as recipes read, mostly because buttoned up, step-by-step recipes just beg to be messed with. It’s rare for me to find a recipe I won’t tweak at all, but writing a blog with recipes necessitates some attention to detail and process. Since I’m sharing a recipe with the online world (or at least 2 or 3 of you), I want to make sure I get things right. For someone who is accident prone and terrible at estimating, planning out ingredients and amounts adds a comforting level of confidence and control. While I’m glued to my measuring cups, and always within reach of my google machine for “how to” research, the boy likes to play things by ear in the kitchen…and in every single area of his life, but that’s another topic altogether. When I’m not making a recipe for the blog, I can usually go with the boy’s improvisational flow. 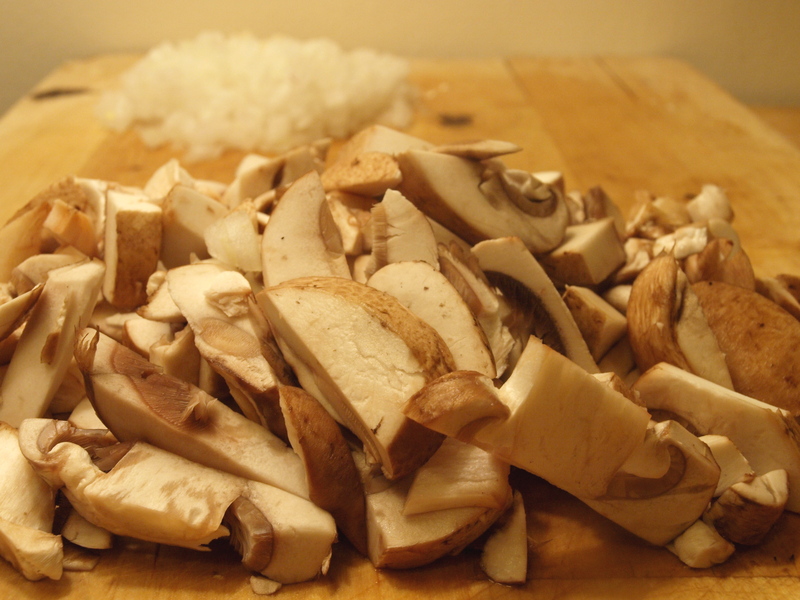 For instance, we have an awesome go-to sauce that combines mushrooms, white wine, broth, and cheese. We made it up on the fly once, and have made variations of it several times since. Although we’ve never measured the amounts, I figured the sauce was so good it needed to be shared. For the pasta beneath the sauce, I wanted to experiment with something new. Gnocchi tastes so decadent, but my google research had taught me that the process of making it at home is deceivingly simple. Since I was elbow-deep in gnocchi process research, I asked the boy to get the sauce together. When he asked for some direction, I told him, “Do whatever you want!” Of course, I had bought the groceries, so I figured my ingredients spoke for themselves. I had a plan, and it was going to be so good. Adapted from a “Ricotta Gnocchi Recipe” on AllRecipes.com. Our own hodgepodge, improv recipe. *Disclaimer: Ingredient amounts estimated. A girl can only recommend using measuring cups so many times before her boyfriend conveniently loses his hearing. Combine the ricotta, eggs, parmesan, salt, and garlic salt in a bowl. Use a fork to stir together. 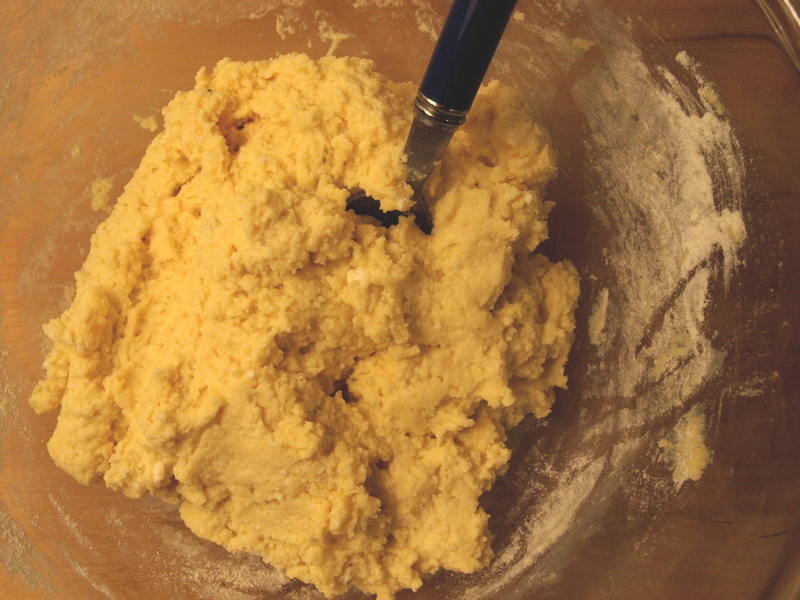 Measure out one cup of flour, and fold into the wet ingredients with a spoon or spatula until you have a loose dough. Form the dough into four balls of similar sizes. Flour a surface, and one-by-one roll the balls into cylinders about 12-inches long. Try to ensure each dough cylinder is around the same size along its length. Use a knife to cut the cylinder into one-inch pieces. 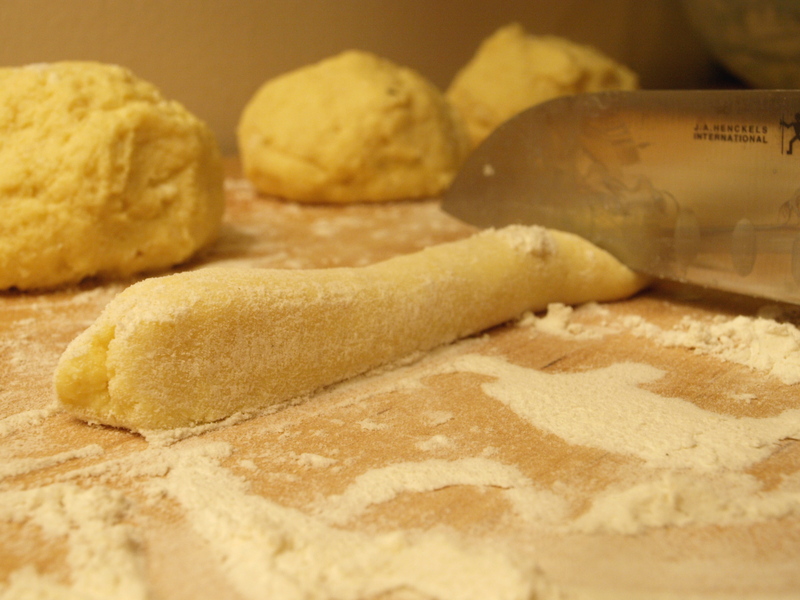 Store the dough gnocchi in the fridge while you prepare the remaining dough balls. 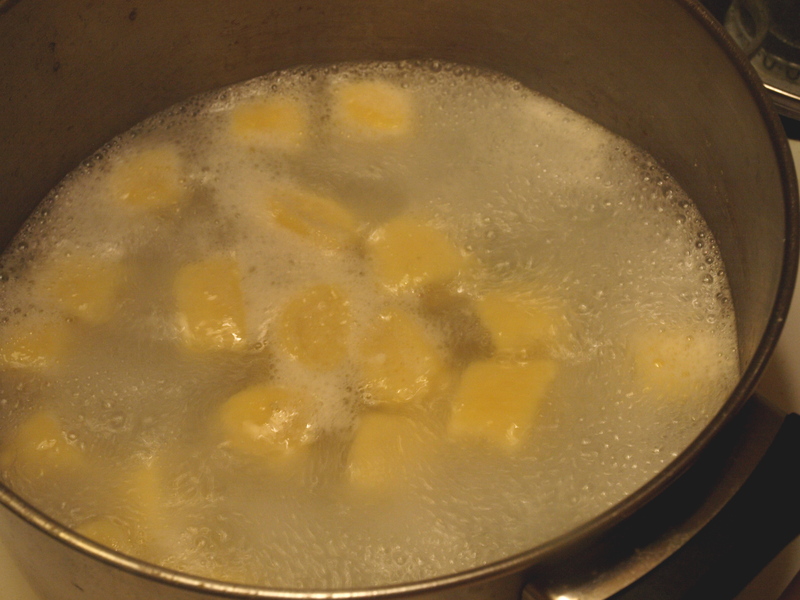 Bring a large pot of water to a boil, then add the gnocchi dough. Depending on the size of your pot, you may need to boil the gnocchi in batches. Use your best judgment, I trust you. 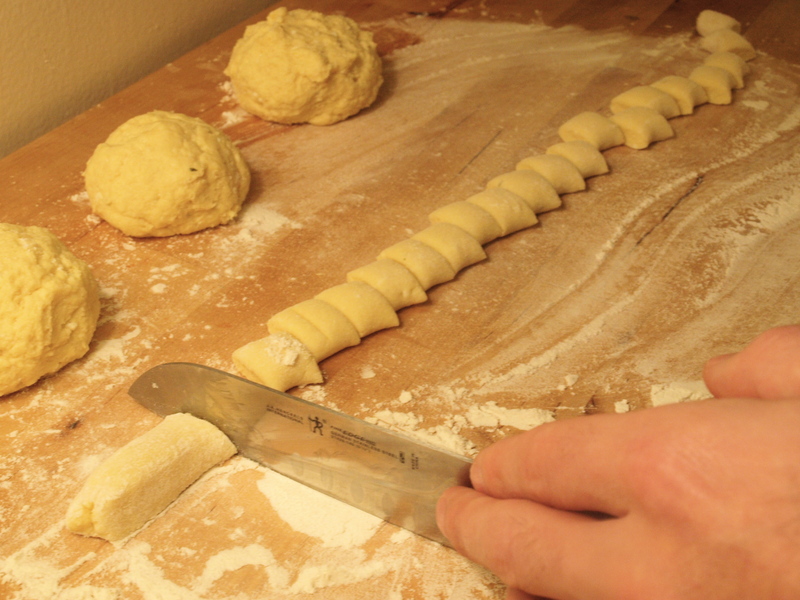 The gnocchi are done once they begin to float, which should take around 3 minutes. Drain and set aside. Easy peasy right? Look at you making your own gnocchi. You’re impressive. When the boy began the sauce, things started out as I had planned. He began by sautéing the onions and garlic in olive oil over medium heat. After the onions were soft, he added the spices and mushrooms, letting them reduce and release their juices for 5 minutes or so. 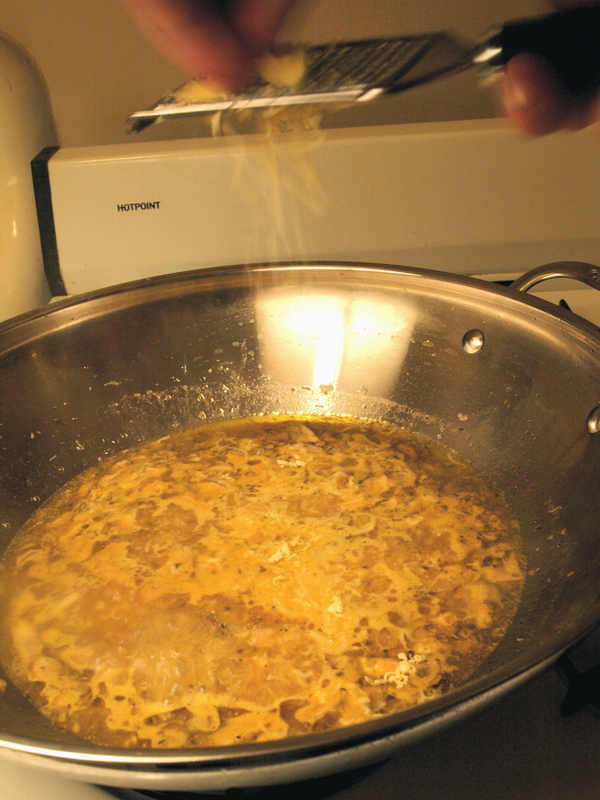 Then he added the wine, let it cook for a few minutes to burn off the booze, and poured in 1 cup of the broth. After the sauce had been simmering for a few minutes, he looked at me with inspired eyes and said, “I think we should thicken this up.” He grabbed the flour, put it in a cup, poured 1/4 cup of broth in, mixed with a fork, then poured this mixture into the simmering sauce. Improvisational, not my style, but effective none the less. He then took gouda out of the fridge (note: not the goat cheese I had intended) and shredded it into the pan. At this point I decided to make a salad. Gnocchi is a bit heavy in its deliciousness, so I thought a spinach salad would be nice addition…alright and maybe because I thought it was a good idea to keep my control freak busy and my hands occupied. Know thyself in all thy faults, right? After stirring in the gouda, the boy took the ricotta out of the fridge scooped out a hefty dollop. I had bought the ricotta for the gnocchi dough, not for the sauce, but I didn’t want to interfere with his creativity (plus I had a salad to make, which was very important). He stirred in the ricotta, with the burner on all the while. My research on process has taught me that cheese goes in AFTER removing sauce from the heat. It turns out this doesn’t really matter, or didn’t in this case. Not that I was concerned though. I was making a salad. When the ricotta (note: also not goat cheese. just saying) was fully incorporated, the boy added the gnocchi to the sauce and stirred over the heat until the gnocchi and sauce were warmed through. After our dinners were plated, the boy took out the goat cheese to sprinkle on top of the gnocchi. Finally! That’s what I’m talking about! I thought. Yes, I realize it’s possible I have a bit of an obsession with goat cheese. He deals with it well. 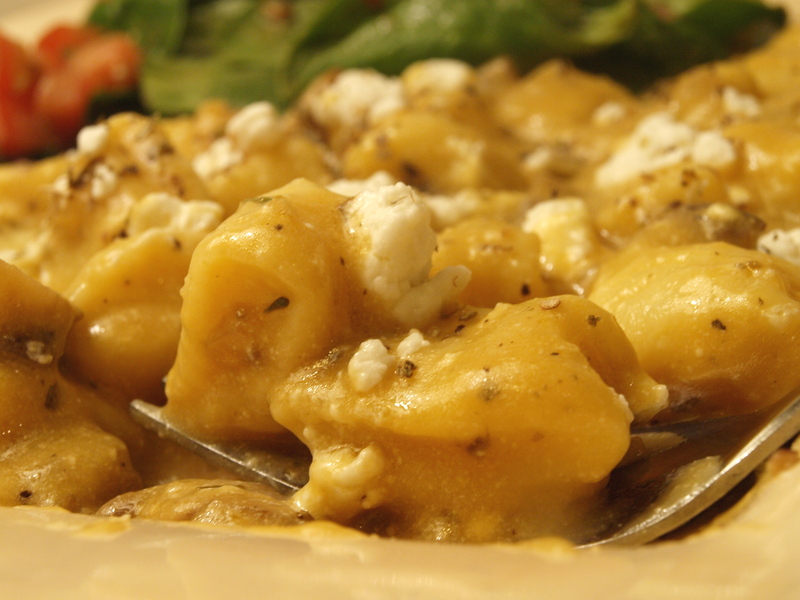 My anxiety from improvisation cleared up entirely when I tasted the gnocchi. This was one of the most incredible dinners I’ve ever eaten, at home or in a restaurant. 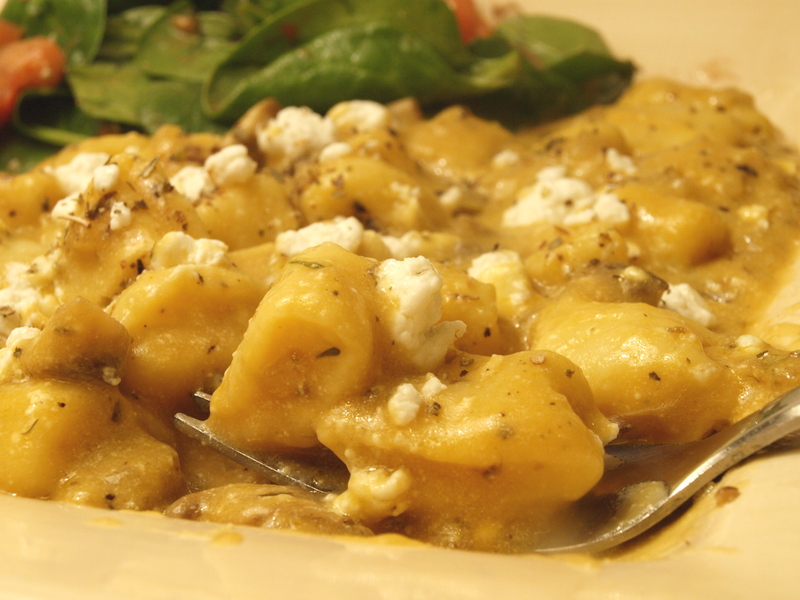 The gnocchi were pillows of creamy, melt-in-your-mouth heaven, and the sauce had just the right amount of salty cheese, earthy mushrooms, and yes, the mid-cooking addition of flour and ricotta resulted in a perfectly thick, velvety texture. I plated a large amount of gnocchi for photographic purposes, but ended up eating it all, and I mean quite literally every last bit of it. The boy even made fun of my “clean plate club” action of scraping the sauce off the plate with my fork, long after my last gnocchi had been devoured. As the boy often tells me, my structure needs to be thrown off sometimes, both in real life and in food life. I may prefer to figure out a game plan prior to diving in, but playing it by ear isn’t always so bad. If it turns out like this meal did, I say bring on the breeziness. Or at least a light wind. 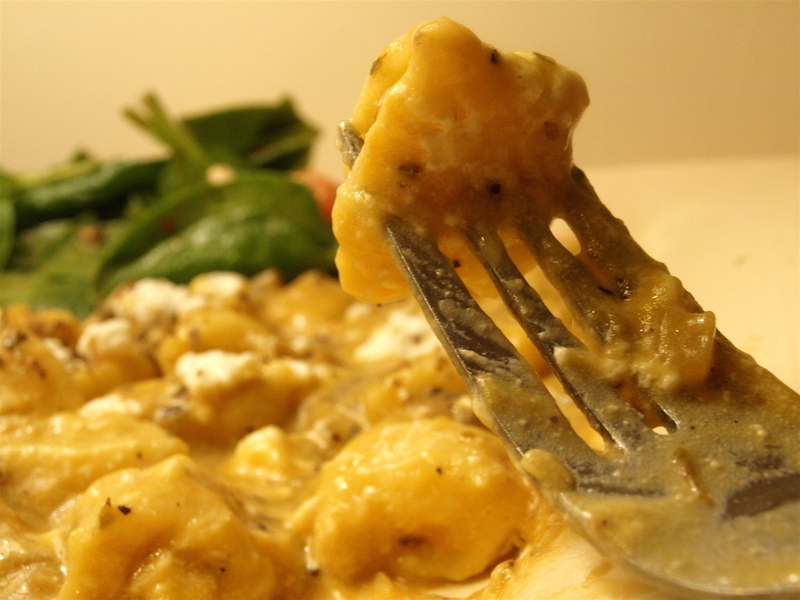 This entry was posted in Italian and tagged Cheese Sauce, Gnocchi, Mushrooms, Vegetarian on February 27, 2012 by Katie. Best post yet!!! “The boy” sounds like an amazing character! Thanks for the good reads!